Action buttons are a feature in Instagram that lets you add a call-to-action to your profile page. This gives your Instagram followers an avenue to take some preferred action, whether it’s calling you or booking an appointment. 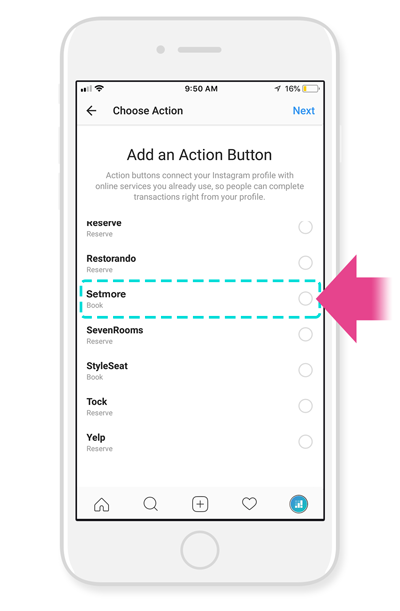 By enabling the “Book” button and linking it to your Setmore account, whenever customers tap the button, your Setmore Booking Page will open within Instagram. Customers can schedule an appointment directly to your Setmore calendar, without having to open a new browser tab or leave the Instagram app. Below we’ll show you how to add a “Book” action button and link it to your Setmore account. 4. Select Setmore from the list of options, and tap Next in the top right corner. 5. Type or paste the web address for your Setmore Booking Page here, and tap Done in the top right corner. The “Book” button will appear on your Instagram profile. Now when customers tap this button, your Booking Page will open on their phones and they can schedule an appointment with you.